IT adoption can get ugly at times, even when you’re in the beauty business. Just ask Nadir Belarbi. As CIO of L’Oreal Canada, he runs the top selling cosmetics company in this country. Although Belarbi didn’t reveal any of his firm’s secret makeup formulas on Tuesday, he did share part of L’Oreal’s own IT adoption journey at the Mobile Enterprise Canada conference in Toronto. By detailing L’Oreal Canada’s false starts, surprises and eventual success in deploying a mobile solution for its sales staff, Belarbi laid out some do’s and don’ts for slaying the mobile enterprise adoption beast. L’Oreal is a multinational corporation with 21,000 employees, 40 manufacturing plants and 6.3 billion (yes, billion) products worldwide. As one of the largest B2C brands on this planet, it takes sales very seriously. “We sell beauty. This is the identity of L’Oreal,” Belarbi said. 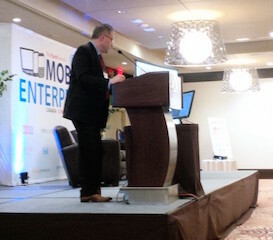 “We sell beauty,” L’Oreal Canada CIO Nadir Belarbi told the Mobile Enterprise Canada conference. Unsurprisingly for a company started in 1909, L’Oreal realized last year that it had some legacy IT issues, including dated technology used by hundreds of sales representatives across Canada. “It was very cumbersome for the sales reps,” Belarbi said. They were using an app called Micro-Rep “surrounded by a galaxy of other applications and dashboards. It wasn’t really manageable. It was creating a lot of workload and the sales reps were not really happy. They did all this through their laptops,” he said. L’Oreal Canada launched an initiative in Q1 2014 to put updated, agile, mobile IT into the hands of its sales staff. After giving the effort the suitably glamorous name of Project Metropolis, L’Oreal Canada conferred with some of its IT partners, Microsoft, HP and Salesforce. Although the eventual outcome revolved around hardware and software, Belarbi’s team based its approach on business goals rather than just technical specs. L’Oreal Canada let its staff test a new sales app, just as customers can virtually test products via its Makeup Genius app shown here. L’Oreal Canada didn’t know yet exactly what it was going to buy or develop. But it knew exactly what it needed. A mobile solution with enhanced UX design. A single solution to replace the mishmash of legacy apps. Something that would help the reps work more efficiently. A system that could build a 360-degree view of L’Oreal customers, as well. In terms of hardware, this basically called for a lightweight device with big-time battery life, 3G and 4G connectivity, MS Office and Excel Macros capability and an extremely user-friendly interface. “They were looking for something to replace their laptops but similar to a tablet,” Belarbi recalled. Since security was top-of-mind, a solution that allowed for quick, easy, reliable VPN setup was a must. “Sales reps are on the road. Laptops get stolen. We don’t want all this corporate data to be used by others,” said Belarbi. The team developed a customized offline sales app module using the Salesforce API. It replaces 13 disparate apps and can handle store event management, file sharing, live communication, budget controls, loyalty programs, dashboards, sales reports, sales targeting and other functions. The company then selected a small group of sales reps to pilot test the new solution on various mobile devices in various settings, from malls in Toronto and Montreal to tiny salons in outlying suburbs. “Test and test and test again. I wanted to see how the solution was behaving in the field,” Belarbi said. IT even went way beyond the phone help line, dispatching tech support on the road to help sales reps test the new system and work out kinks on the fly. L’Oreal Canada headquarters in Montreal. “We realized we had to send someone from IT with (the reps) to figure out what was not working. So (IT) was taking notes and identifying each problem,” he said. And a few problems did crop up during the trial runs. Wimpy device batteries. Incompatibility with L’Oreal’s VPN system. An OS that 85 per cent of the sales reps found “confusing.” Connectivity issues in major cities as well as smaller ones. After road testing three types of tablets and two operating systems, L’Oreal Canada ended up deploying its customized Salesforce solution on HP’s ElitePad 900 G2 tablets. The solution runs on Windows 7 and is integrated with Outlook. Being the marketing giant that it is, L’Oreal even made a video to promote the solution internally, essentially selling its own sales people on the new system they’d be using. The company also gave the reps two days of intensive training on the solution. Some reps kept using the legacy apps and old laptops until the company disconnected them or let the licenses lapse. When all the customizing, testing, tweaking and training was done, Project Metropolis came in under budget. In IT, that’s a rare and beautiful thing for any manager to see.